GLENMONT, N.Y.—For the third consecutive year, PIA Management Services Inc. has received a Gold Award in the "print media/association/magazine" category for its PIA magazine. The association also received a Gold Award in the "digital media/e-communication/e-newsletter" category for its recently redesigned Reporter. The MarCom Gold Award is presented to entries judged to exceed the high standards of the industry. The association also received an honorable mention in the "print media/publications/other" for a PSA/flier, which was a collaborative work of the Professional Insurance Agents of New York State and the New York State Builders Association to inform homeowners about insurance considerations for their home-building projects. 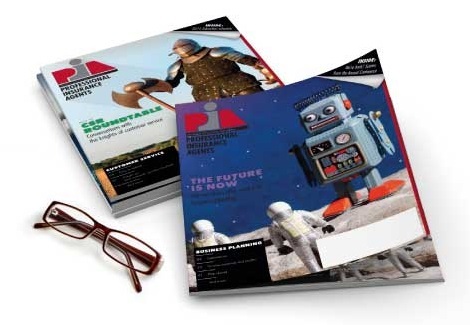 PIA magazine is a monthly, state-specific publication for professional independent insurance agents in Connecticut, New York, New Jersey, New Hampshire, Vermont and Tennessee, which issues its publication on a quarterly basis. It has the most active, qualified readership of any trade magazine serving the insurance community, reaching more than 4,500 member agencies with a pass-along readership of 20,000 industry professionals. The PIA Reporter, which was redesigned earlier this year, is distributed once a month to its members in Connecticut, New Hampshire, New Jersey, New York and Vermont. The completely digital version of the Reporter is easier to read and navigate; and it makes it easier for members to access their benefits. "We are honored that PIA magazine and the Reporter have been recognized by this international award competition," said PIA Management Services Inc. President and CEO Mark J. LaLonde, CPIA, CIC, AAI. "We strive to ensure that our publications provide PIA members with information that is salient and valuable to both them and their agencies." The PSA/flier that was submitted on behalf of PIANY and the NYSBA stressed the insurance factors that home builders need to consider before they start a construction project. The flier was designed by PIA Creative Services, PIA’s in-house advertising agency. "We are thrilled that our work with PIANY to help consumers understand what they need to know when building, remodeling or fixing a home has been internationally recognized," said Executive Vice President Lewis Dubuque of the New York State Builders Association. "This honor highlights the importance NYSBA members place on industry professionalism as well as the value of consumer education." More than 6,000 entries were submitted to the MarCom Creative Awards, which is an international awards competition recognizing the outstanding achievements by marketing and communication practitioners. PIA Management Services Inc. is the umbrella corporation that manages the Glenmont-based Professional Insurance Agents associations, representing independent insurance agencies, brokerages and their employees in New York, New Jersey, Connecticut, New Hampshire and Vermont. PIANY, PIANJ, PIACT, PIANH and PIAVT is a partnership of five, state trade associations representing independent insurance agencies, brokerages and their employees throughout their respective states.